This post is kindly brought to you by EWG VERIFIED™, who compensated me for this sponsored post. All product descriptions, tips and opinions are my own! Since 2007, when I transitioned to clean beauty, I’ve been bombarding the Environmental Working Group’s (EWG) Skin Deep Database to learn how my favorite products and their ingredients stack up. Now, the EWG is offering yet another way for ingredient-conscious beauty junkies to vet their purchases. Meet EWG VERIFIED™, the Environmental Working Group’s new product verification program designed to help you easily identify beauty products that meet the organization’s health and transparency standards. If you’re familiar with the Skin Deep Database, you know that products and ingredients are rated on a 0-10 scale, with low scores of 0-2 deemed lower-risk and safer for your health. These products and ingredients are color-coded green. Echoing this system, products with the EWG VERIFIED™ mark score in Skin Deep’s “green” range and also meet additional criteria set by EWG scientists. This includes ingredients that the EWG has placed on its “unacceptable” list and ingredients that meet limits on the “restricted” list. These ingredients have been banned or restricted by the U.S., international governmental agencies or other public health organizations, such as the World Health Organization. Companies who submit their products for verification must also fully disclose ingredients — including the specific ingredients that make up “fragrance” mixtures. This is huge! Speaking of size, clean beauty companies big and small are submitting their products for verification. Beautycounter, MyChelle, Rejuva Minerals, Makes 3, Celtic Complexion, W3ll People, Cocoon Apothecary, Just The Goods, Bioassance, Jouve, Purelygreat and Sally B’s Skin Yummies all have products that have earned the EWG VERIFIED™ mark. Beautycounter Nourishing Cleansing Balm: This luscious, dense balm (made of apricot kernal oil, shea butter and mango butter) hydrates and cleanses while removing makeup and prepping your skin for the second cleanse. MyChelle Dermaceuticals Refining Sugar Cleanser: Speaking of the second cleanse, this refining face wash features green tea and witch hazel. It gently exfoliates will dissolving the final traces of makeup and oil. 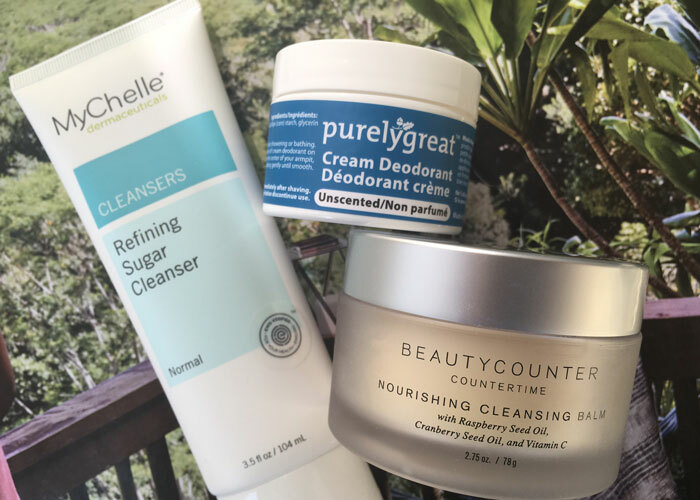 Purely Great Unscented/Citrus Cream Deodorant: Just in time for warmer weather, this 3-ingredient deodorant is ready to take on my pits (and get a review in my “ultimate guide to natural deodorants“). Cocoon Apothecary Eyewaken Eye Cream: I’ve used and loved this eye cream in the past and am thrilled to see it back in my lineup! It’s made with rose hydrosol, argan oil and grapeseed oil. Makes 3 Organic Lavender Cheek to Cheek Body Balm: This convenient little tine contains a blend of coconut oil, shea butter, jojoba oil and aloe vera for simple, everyday moisture on the go. Sally B’s Glossy Lip Gloss: This hot pink lip gloss adds a hint of color and shimmer to the lips and imparts maximum moisture thanks to beeswax, shea butter and vitamin E.
W3LL PEOPLE Bio Brightener Stick: Giving the phrase “glow stick” a new meaning, W3ll People’s stick luminizer highlights your most beautiful features and adds a bit of moisture thanks to grapeseed and safflower oils. 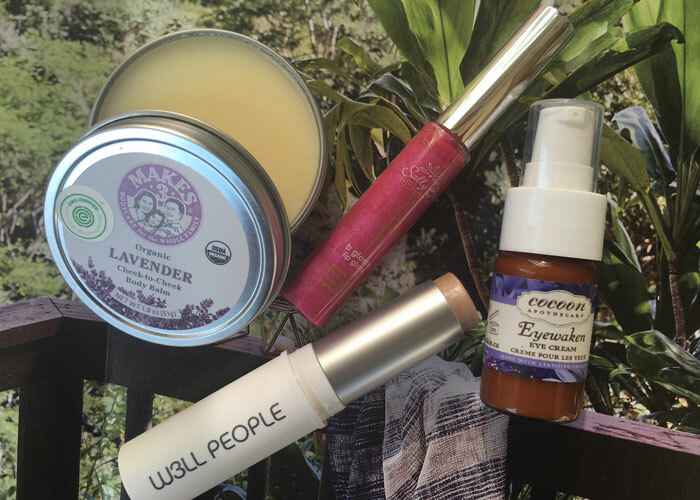 Wanna get your hands on these EWG VERIFIED™ products — and then some? 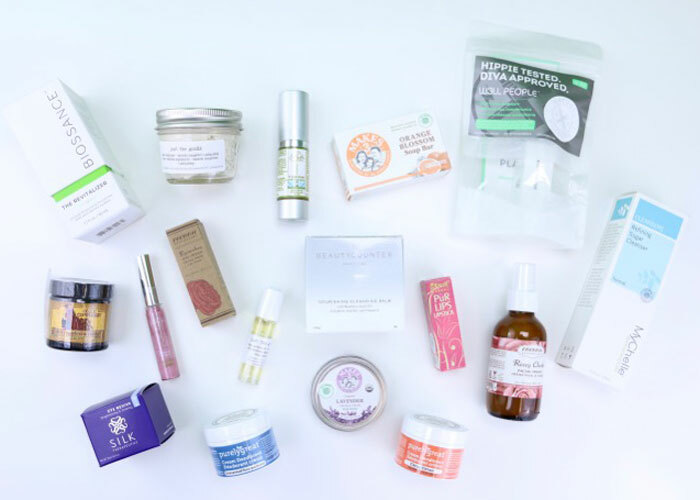 The EWG is offering an awesome giveaway that includes SIXTEEN (!!!) SEVENTEEN (!!!) verified products, including the ones I mentioned above. What do you think about the state of third-party verification of personal care products? What marks, seals, verifications or certifications do you look for in beauty products? What sorts of legislation would you like to see around beauty product labeling? Tell me in the comments section!